I’m really just testing the blogging function from my Flickr account. This is actually an old photo from around 2004, if I’m not mistaken. It’s was taken in one of the shrines / temples in Kyoto. 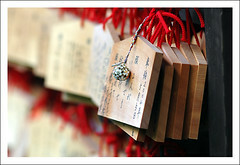 People make an offering and write their prayers on these wooden plaques and leave them at a special prayer wall. Someone had left a little silver trinket, perhaps as an offering. It seemed poetic to me, and beautifully naive; like the prayer of a child.